This week’s 205 Live starts with the now traditional intro package from General Manager Drake Maverick hyping the matches for tonight. In the opening bout, Gran Metalik looks to add to last week’s victory over Tony Nese by taking on Nese’s tag partner, Buddy Murphy, whose own mission is to build momentum on his way to a Cruiserweight Championship match at Australia’s Super Showdown. In the main event, Cedric Alexander and Akira Tozawa look to exact revenge on Drew Gulak and Jack Gallagher in tag team action; both men victims of sneak attacks from the duo in recent weeks. Vic Joseph, Nigel McGuinness, and Percy Watson are on commentary promoting tonight’s matches, as well as Murphy’s home country title shot in Australia. Similar to his match with Kalisto two weeks ago, a small contingent of the crowd chant for Buddy Murphy in the early stages of the match. In a show of validating that support, Murphy’s brute force tactics rock Metalik somewhat. But the Lucha House Party member’s agility and balance affords him early dominance with a moonsault off the turnbuckle to Murphy on the floor outside. Metalik earns the first cover of the match with a modest one-count. That same turnbuckle post sees more action as Murphy slams Metalik’s head into it, the Mexican wobbling down towards the apron from the impact. Murphy’s temper takes hold again with a punt to the back of Metalik’s head back in the ring. A modified rear chin lock overpowers Metalik. He tries to escape, but Murphy rains strong right hands down on Metalik. Murphy props Metalik onto the turnbuckle with a superplex in mind, but Metalik fights back, flooring Murphy with a sunset powerbomb. Metalik continues his comeback in the match with a series of high impact kicks and rope-assisted cross-bodies. A second rope moonsault by Metalik connects. However, he makes a mistake in attempting one from the top rope, as Murphy swipes his legs out. Metalik tries to right his wrong by dancing on the ropes and jumping off for a hurricanrana. Murphy counters in brutal fashion with subsequent powerbombs. This only earns a two-count for Murphy. The action speeds up with both men landing high impact knees and superkicks upon each other. Metalik is about to score a victory with a lariat and then a Metalik Driver, but Murphy kicks out once again. Murphy is a self-professed juggernaut, and he proves this moniker once again as he lands a stiff running knee upon Metalik’s face. He capitalizes quickly with his Murphy’s Law for a definitive victory. Murphy cuts a rare in-ring promo after the win. He reminds everyone that you can’t stop the unstoppable. He says he is the biggest, fastest, and strongest cruiserweight on 205 Live. He will prove that by becoming the new Cruiserweight Champion in his hometown of Melbourne. Vic Joseph announces that Mustafa Ali has now been medically cleared to wrestle after his collapse in the ring at the hands of a Hideo Itami beating on 205 Live some weeks ago. Ali is backstage and is approached by the champion, Cedric Alexander. Ali wishes he was Alexander’s tag partner tonight, but the champion assures Ali that his time will come and that he is happy with his partner for tonight. The camera pans to Akira Tozawa who is hyping himself up to comically intense levels. Mustafa Ali makes his way to the ring and earns a respectable smattering of praise from the crowd. Before the match starts, Hideo Itami’s music hits. The Japanese legend has a microphone and taunts Ali in his native tongue. He then switches to English to claim that he missed Ali, wishing him luck for his match. The bell rings, and apart from the typical limited flurry of offense contributed by the enhancement talent, Ali makes quick work of Thompson, all the while keeping a close eye on Itami at the entrance. After a tornado DDT, Ali seems to take some time upon the top rope. But he regains confidence quickly and lands the “054”. After winning the match, Ali stares down Itami, his intentions of revenge written clearly upon his face. Backstage, Drake Maverick is warning Drew Gulak and Jack Gallagher to behave tonight after the chaos they have caused of late. Gulak and Gallagher laugh it off, suggesting that they are bringing order to 205 Live, as they make their way out for their match. 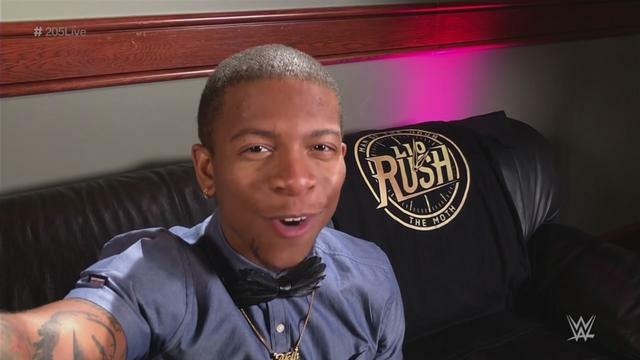 Noam Dar and Lio Rush’s recent exchanges are brought up by Vic Joseph. The two young Superstars taunt each other in the form of selfie videos, hyping their match for next week. Gulak and Gallagher make their way to the ring first, staring their opponents down as they separately come down the ramp. Alexander and Gulak begin the bout. After a brief technical exchange, Alexander attempts a Lumbar Check. Gulak is shaken and offended. Wearily, he tags Gallagher into the match as he composes himself on the apron. Tozawa comes into the match and joins Alexander in delivering tandem fists straight to either side of Gallagher’s face, the Englishman barely making it to Gulak’s outstretched hand before collapsing in the corner. Gulak comes in and also receives a punch from Tozawa. The former champion is pumped for tonight, locking Gulak in an octopus stretch. After the referee breaks up the hold, Gallagher re-enters the match. Tozawa tries a cross-body, but both Gallagher and Gulak catch him with ease. Tozawa’s early drive is all but gone as Gallagher systematically wears him down with a series of stretches and knees. He hits Alexander with a cheap shot, who looks to rush the ring. As the referee keeps Alexander from rushing the ring, Gulak and Gallagher hit Tozawa with a flurry of offense. Textbook heel work from the tag team right there. Gulak looks to bookend his decimation of Tozawa with a powerbomb, but Tozawa counters with an impressive DDT for a near fall. Both men tag in their partners looking for fresh energy, and Alexander continues keeping his team’s momentum on his side with the handstand springboard “Neuraliser”, and a Spanish Fly. The pin attempt is broken up by Gulak, who smiles mischievously as he does so. With Alexander distracted by Gulak’s behavior, Gallagher attacks from behind with a high dropkick into the corner. the Cruiserweight champion avoids embarrassment by evading what could have been his first pinfall defeat in over eight months now. Gulak and Gallagher punish Alexander with a series of tandem offense. Unbeknownst to the pair, Alexander tags in Tozawa, who enters the fray and gets the crowd on his side with his patented suicide dive headbutt on Gallagher. He goes for his top rope senton, but Gulak pulls his partner away from impact at the last second. Tozawa’s success rate at landing his finisher takes another blow. Alexander is unable to continue after Gulak launches his head full force into the corner stanchion. He and Gallagher seize the opportunity and home in on Tozawa. Gallagher lines Tozawa up for his stable leader. Gulak screams into the camera that we are getting a Better 205 Live and taps Tozawa out with the Gulock. After the match, Kayla Braxton asks for Drake Maverick’s comments backstage. Maverick understands that Gulak and Alexander won’t stop attacking each other until Gulak has his title match. With that in mind, Maverick acquiesces and makes Drew Gulak vs Cedric Alexander for the Cruiserweight Championship next week. 205 Live goes off the air. Check out this week’s very special “Ricky & Clive Wrestling Show“ on the Social Suplex Podcast Network. Ricky and Clive are joined by Kyle Moores, Karl Ervin, and Rance Morris of Outsiders Edge to conclude our collaborative wrestling awards panel show (part 1 available here). In this half, we each pick our Best and Worst Males, Females, Tag Teams, Stables, and PPVs from WWE, NJPW, ROH, Impact, and All In. As is the Ricky & Clive tradition, we finish the show with a quiz. Have a look at all of my 205 Live reviews to date. And last, but by no means least, I talked all things with Lords of Pain Radio’s very own “Implications” on last week’s “Perfect 10 Wrestling“!